What an absolutely fab idea! A deck of travel cards of which you need only carry one or two per day or per walk instead of schlepping a travel guide along. Ingenious! 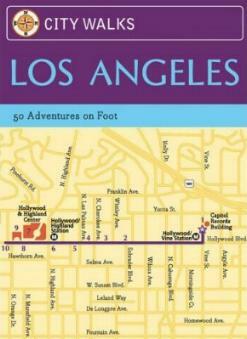 Now, I've been to Los Angeles a couple of times and I have walked and taken the bus and the subway. Never used cabs as I couldn't afford them. However, my walks were never structured so I didn't get to see as much as I should have. Next time I go, I am definitely taking this "book" with me as there is so much to see in this amazing city. In this deck you'll find 50 walks, and each card provides "a summary of attractions along a particular route" which is all you need. The walks are all more or less one to two miles long and would take about one to two hours to complete, making it easy to combine a few per day if you're pressed for time. Being such an enormous city and rather spread out, you'll probably need to get to the start of some walks (unless you combine a few that are near each other) by public transport, or in some cases, by taxi. Each card has a detailed map to guide you along your way. Some of the walks you can explore include Chinatown, South Park, Echo Park and Angeleno Heights, Hollywood Sign, Hollywood Boulevard, Sunset Boulevard, Beverly Hills, UCLA, Getty Center, Venice Boardwalk, Malibu, and Hermosa Beach among many others. The cards give precise directions such as "walking northwest..." or "...turn right and continue on the street's north side" — what could be easier? Museums are pointed out as are interesting stores, restaurants, markets, buildings, parks, clothing stores and more. You're warned whether or not steep or moderate inclines exist on any given walk and which walks are best reached by car. Tip: Take along a pedometer to measure how far you walk. You'll be pleasantly surprised or shocked. If you're directionless, take along a compass too. Conclusion - One of the best travel guidebook ideas I've ever seen! Perfect for those of us who love exploring cities on foot.